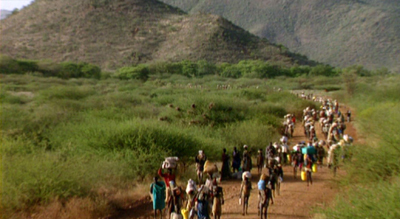 Twenty years ago 20,000 orphaned and displaced boys began streaming out of Sudan. They languished with no future in poor camps in neighboring countries. In 2001, about 3,000 of them were resettled in the US. This doc is the true story of a few of those boys, almost men, as they leave their very stark pastoral life (zero electricity or running water) and slip unnoticed into frantic, crazy urban America. This is not the only documentary about this dramatic transition. The Lost Boys of Sudan, for instance, has many fans. But by following the immigrants for a longer period, both before they arrive and after their shock immersion into American culture, God Grew Tired of Us is the most rewarding and the deepest. One thing I learned from this film: no matter how amazing modern amenities are, people will take them for granted after about 5 minutes. But as these really remarkable and likeable “boys” show, it’s people and relationships that really count for wealth.